Dealmaking is all about achieving a successful deal outcome: creating a true exchange of value. Dealmakers across the world, from different cultures and nationalities, use different methods, processes and communication styles in dealmaking, but they all focus on striking deals to facilitate family, trade, community and national best interests. The key elements in a deal – selling, persuading, negotiating and signing a contract – are the same the world over. Globalisation means that companies around the world will continue to grow, refocus, merge – and, sometimes, retrench – through making deals. And so, the risks of not having a good dealmaker at the helm will increase. Business leaders and decision-makers must be able to effectively identify a deal’s strategic, financial and operational value and then to execute and manage it efficiently. But dealmaking is not limited to CEOs. Every person or organization engages in dealmaking at some point. Dealmaking is an active and deeply practical skill. It requires flexible and adaptable listening, reading, absorbing and summarizing skills. The premise of DEALMAKING FOR CORPORATE GROWTH: THE 7 P APPROACH TO SUCCESSFUL DEAL EXECUTION is that these, and other related, dealmaking skills can be significantly enhanced by following some proven steps. Pay-out or Post-mortem: Win or lose, learn for the next time. 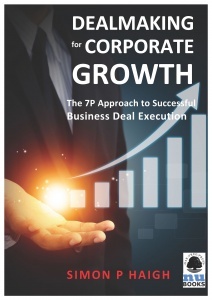 DEALMAKING FOR CORPORATE GROWTH also includes a Foreword by Marshall Goldsmith, New York Times bestselling author of Triggers and What Got You Here Won’t Get You There, two of Amazon.com’s ‘100 Best Leadership and Success Books to Read in a Lifetime’. If you’re planning to grow your company, dealmaking is an essential leadership skill – and DEALMAKING FOR CORPORATE GROWTH is essential reading.